Joliet Ballroom at Holiday Inn Airport West! A.Bond on Discover St. Charles! Featured On TLC’s “Four Weddings”! 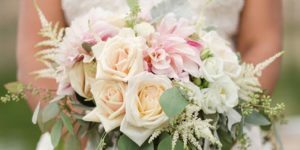 Lawrenceflorist.biz is the Wedding Site for Lawrence Florist located in Historic St. Charles, Missouri. All wedding services are customized. To purchase flowers and floral arrangements from our shop, please visit lawrenceflorist.net. Lawrence Florist is open from 8:30 a.m. to 5:00 p.m., Monday through Friday and from 8:00 a.m. to 12:00 p.m. on Saturday. To help assure on-time delivery during the busy holiday season, place your order at least 1 day prior to the following major holidays: Thanksgiving Day, Christmas Day, New Year's Day, Valentine's Day, Easter, Administrative Professionals Week, Mother's Day, Memorial Day, Father's Day, Independence Day and Labor Day.